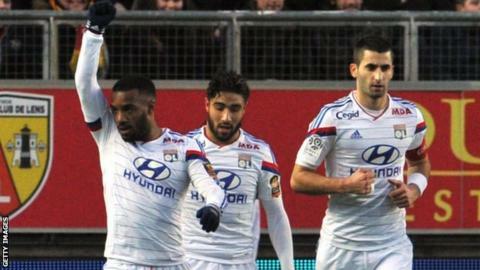 Lyon moved four points clear at the top of Ligue 1 with a 2-0 win at Lens. Jean-Philippe Gbamin backheeled the ball into his own net to put the visitors ahead after 21 minutes. Alexandre Lacazette scored his 20th league goal of the season and doubled's Lyon's lead when he converted a penalty after Boubacar Sylla's handball. Hubert Fournier's Lyon team, who are aiming to win the title for the first time since 2008, have now won six league matches in a row. Marseille, St Etienne and Paris St-Germain - second, third and fourth respectively - all play on Sunday. Fifth-placed Monaco won 1-0 at home to Nantes, courtesy of a goal from Bernardo Silva. Match ends, Lens 0, Lyon 2. Second Half ends, Lens 0, Lyon 2. Lindsay Rose (Lyon) wins a free kick in the defensive half. Foul by Adamo Coulibaly (Lens). Foul by Christophe Jallet (Lyon). Pierrick Valdivia (Lens) wins a free kick in the defensive half. Wylan Cyprien (Lens) wins a free kick in the defensive half. Substitution, Lyon. Yoann Gourcuff replaces Rachid Ghezzal. Substitution, Lens. Wylan Cyprien replaces Benjamin Bourigeaud. Attempt missed. Ahmed Kantari (Lens) right footed shot from the centre of the box misses to the left following a corner. Corner, Lens. Conceded by Maxime Gonalons. Foul by Pierrick Valdivia (Lens). Offside, Lens. Ahmed Kantari tries a through ball, but Adamo Coulibaly is caught offside. Attempt missed. Pierrick Valdivia (Lens) left footed shot from outside the box misses to the left. Attempt blocked. Quentin Lecoeuche (Lens) left footed shot from the centre of the box is blocked. Assisted by Lalaïna Nomenjanahary with a cross. Substitution, Lyon. Arnold Mvuemba replaces Mouhamadou Dabo. Attempt blocked. Ahmed Kantari (Lens) left footed shot from the centre of the box is blocked. Foul by Mouhamadou Dabo (Lyon). Quentin Lecoeuche (Lens) wins a free kick on the right wing. Attempt saved. Nabil Fekir (Lyon) left footed shot from a difficult angle on the right is saved in the bottom right corner. Assisted by Alexandre Lacazette. Attempt missed. Alexandre Lacazette (Lyon) left footed shot from a difficult angle on the left is close, but misses to the left. Corner, Lyon. Conceded by Benjamin Boulenger. Substitution, Lens. Quentin Lecoeuche replaces Alharbi El Jadeyaoui. Rachid Ghezzal (Lyon) wins a free kick in the attacking half. Foul by Ahmed Kantari (Lens). Attempt saved. Pablo Chavarria (Lens) left footed shot from the centre of the box is saved in the centre of the goal. Assisted by Benjamin Bourigeaud with a through ball. Ahmed Kantari (Lens) wins a free kick in the defensive half. Foul by Baptiste Guillaume (Lens). Corner, Lens. Conceded by Samuel Umtiti.